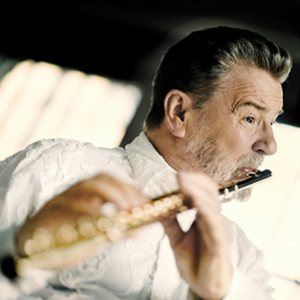 Sir James Galway OBE (born 8 December 1939) is a virtuoso flute player from Belfast, Northern Ireland, nicknamed "The Man With the Golden Flute". Following in the footsteps of Jean-Pierre Rampal, he became one of the first flute players to establish an international career as a soloist. Galway went to London as a teenager to study the flute. He studied at the Royal College of Music under John Francis and then at the Guildhall School of Music under Geoffrey Gilbert. He then studied at the Paris Conservatoire under Gaston Crunelle and Jean-Pierre Rampal and also privately with Marcel Moyse. Following in the footsteps of Jean-Pierre Rampal, he became one of the first flute players to establish an international career as a soloist. Galway went to London as a teenager to study the flute. He studied at the Royal College of Music under John Francis and then at the Guildhall School of Music under Geoffrey Gilbert. He then studied at the Paris Conservatoire under Gaston Crunelle and Jean-Pierre Rampal and also privately with Marcel Moyse. After his education time he spent fifteen years as an orchestral player. Sir James Galway played with the Philharmonia Orchestra as it rose to prominence in the 1950s. He auditioned for the Berlin Philharmonic Orchestra under Herbert von Karajan, and was principal flute of that orchestra from 1969 to 1975. To Karajan's surprise and dismay, after a period of some disagreement, "Jimmy" Galway decided that he would leave to pursue a solo career, which he succeeded in doing admirably. He still performs regularly and is one of the world's leading classical flute players. He is Principal Guest Conductor of the London Mozart Players, based at the Fairfield Halls, Croydon, South London. And most recently, he performed for the Academy Award-winning ensemble recording the soundtracks of Peter Jackson's Lord of the Rings film trilogy. He now resides in Meggen, Switzerland, with his U.S.-born wife, Jeanne, also flute player. They often tour together playing duets, accompanied by Phillip Moll on piano.